Getting cracking on the 2014 Mass Build! 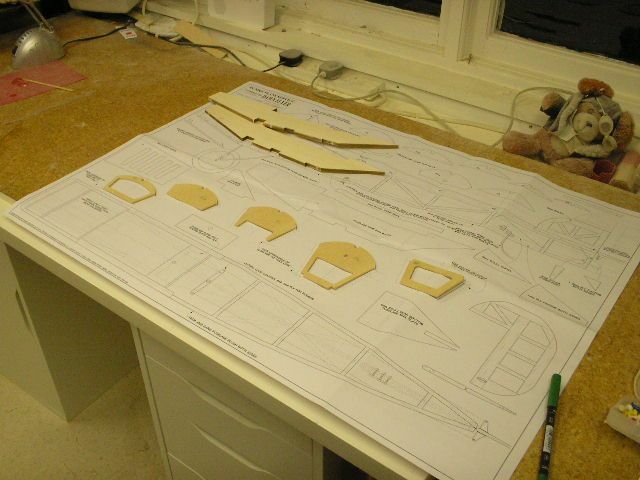 Well 2014 is with us tomorrow - time to get started on the Mass Build! 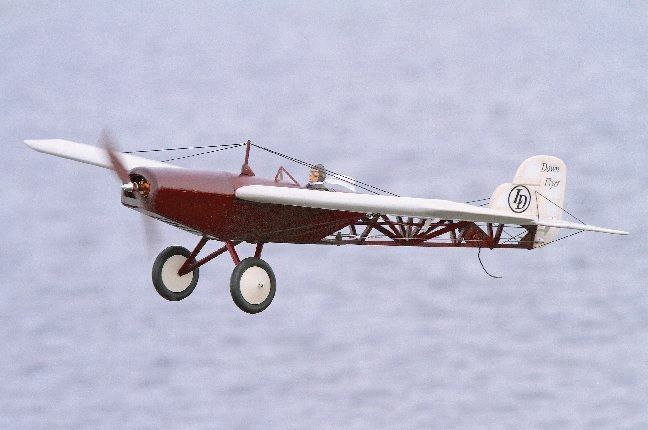 The Dawn Flyer was my vote, I'm hoping for a nice relaxing model for the long balmy summer evenings we're going to have in 2014! I want to complete this build as quickly if I can as I have another build in mid flow! For this reason I bought the CNC pack - saves a lot of time. I will have in all the rest of the wood I need, but if you're new to building and don't have a "stash" of wood you might want to buy the woodpack as well. now that's a sight you don't see often - my building board clear, well nearly clear! Next pin the plan down and lay a sheet of clingfilm over that and off we go. 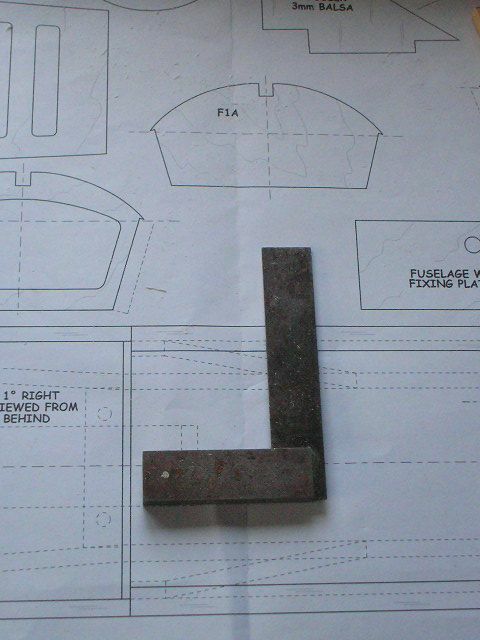 We have to sort out F1 and F1A first - they will be glued back to back to make a single double thickness former. But the position of these along the fuselage side is a "moveable feast" - ie its exact position is governed by what motor we're going to use. 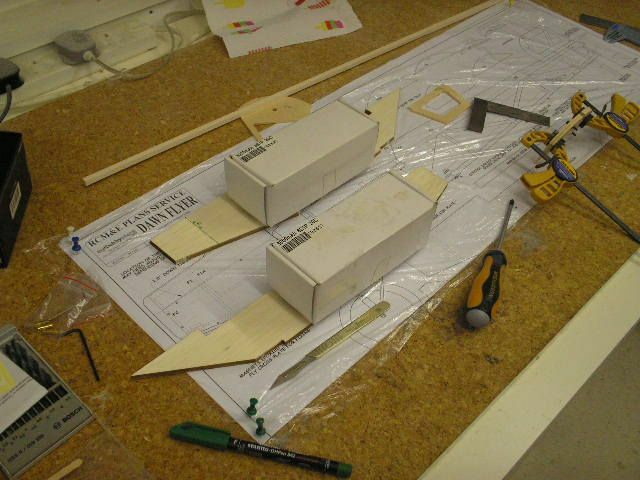 I'm planning to use an E-Flite Power 10 that has come out of another model. 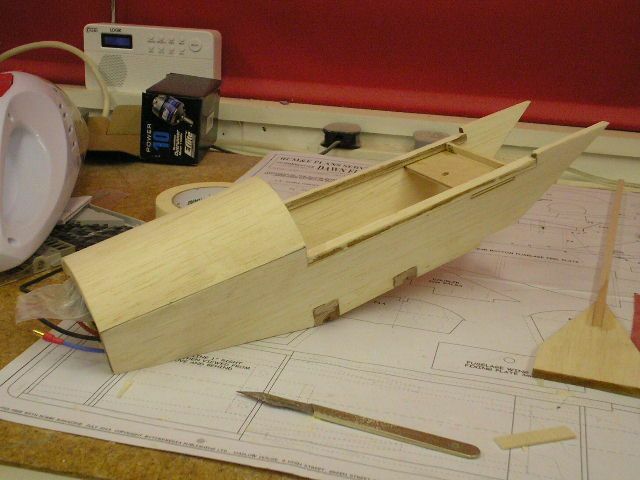 In theory its a bit small for this model - but its a powerful little number so I think it will be fine. So the length of that sets how far back F1/F1A have to go. Don't forget to make a right and left-hand side! Its easy to make two rights! 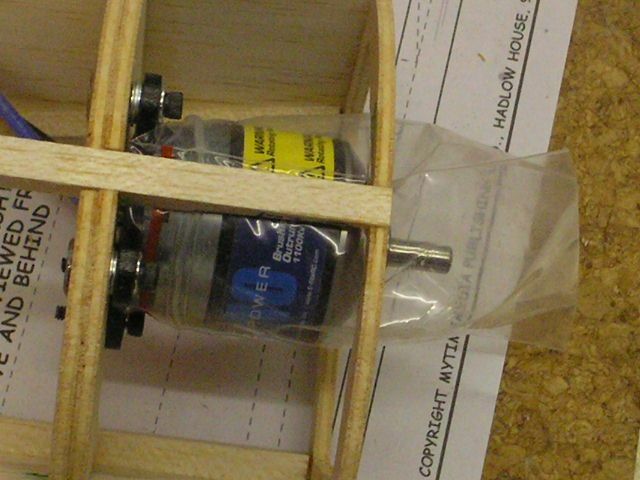 Next weigh those doublers down - a couple of six cell Lipo's do the trick! OK, we have to leave all that to dry now - and the family are kind of suggesting that I should be doing something else on New Years Eve! But at least we've made a start! your cracking on with it young man. just don't forget to finish the tiffie. Do you have a pic of what it'll look like? Where would I be without teddy to keep an eye on me? Don't worry Tony - the Tiffie is looking down on me from the rack, this is just a "breather"! yeah i try to convince myself like that as well. Just had a question back stage about side and down thrust on the Dawn Flyer - I meant to mention this but forgot! Normally you would offset the mount allowing for the right and down thrust so the prop would be in the centre of the nose - as I did here (approximately three quarters of the way down the page) with the Tucano last year, where I went into some detail on this issue and how to calcualte the offset. 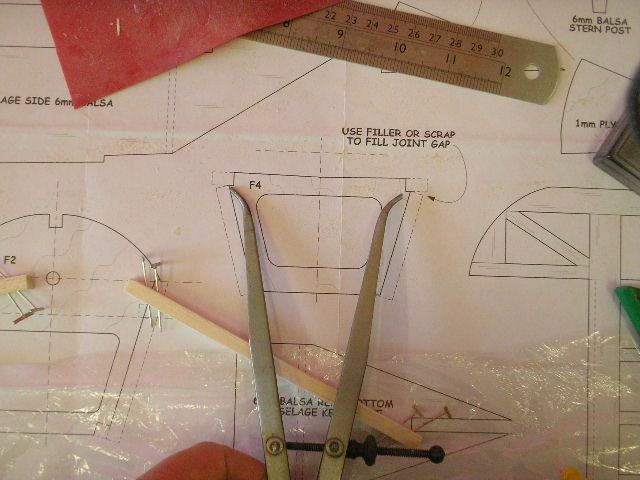 But both the right thrust and down thrust specified in this design of Lyndsey's is very small - I don't have the plan in front of me - but its only of the order of one degree! 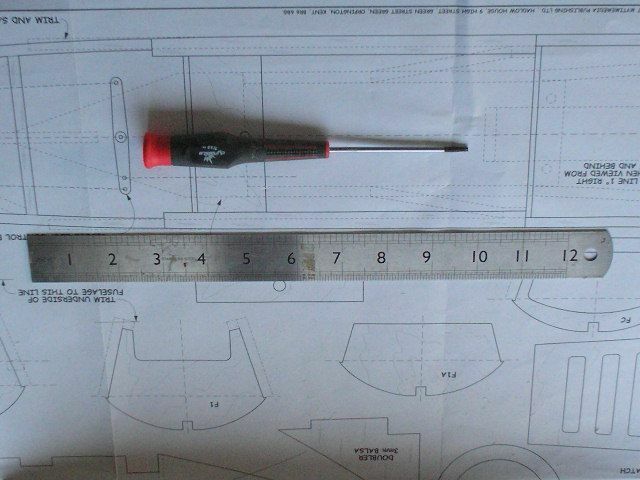 So, given how small the model is, the offset would be about 1/64" - not really worth worrying about! Also - unlike the Tucano which had a pointed nose that had to blend into the spinner - the Dawn Flyer's nose offers plenty of scope for a bit of "cosmetic surgery" to obscure such a tiny offset! No big deal - just enlarge the hole a little and all is well. Sorry Danny! Not so neat I know, but it works and no one will see this bit! 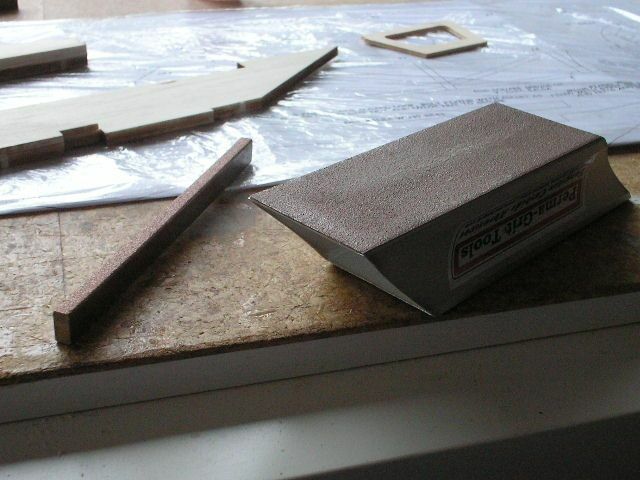 And then we can start adding the formers - being very careful to be sure that they are square,.. 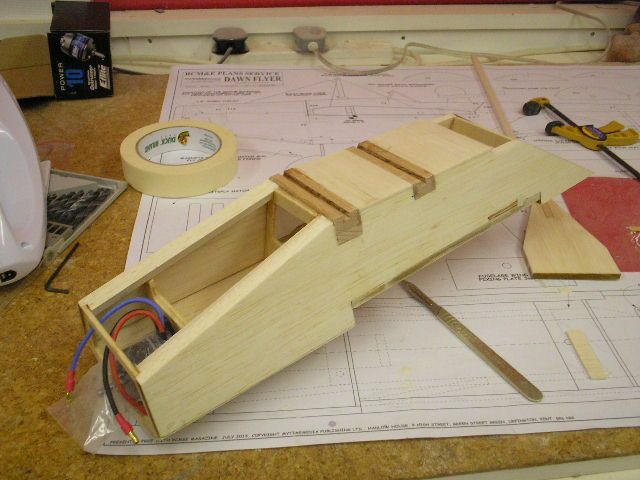 Normally I would use a fuselage jig here to keep everything square - but the "coffin shaped" fuselage with sloping sides makes that a non-starter! So we just have to be very careful and line everything up as best we can. 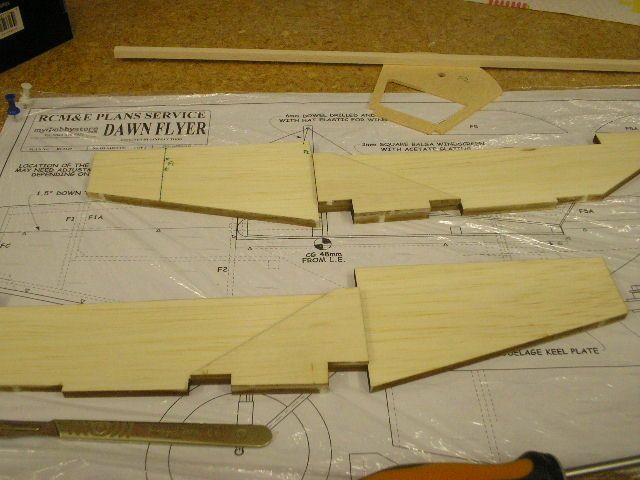 When set they will need to be sanded flush to the fuselage sides. Slow down BEB, you're making me giddy building at this rate. I need the smelling salts. Yes, teddy is a slave driver! Better fasten your seat belt Colin and keep the smelling salts handy! Well I've hit the first snag - fitting the motor in! I seem to be destined to have this problem with Mass Build models! I must pick one with a bigger cowl next year. 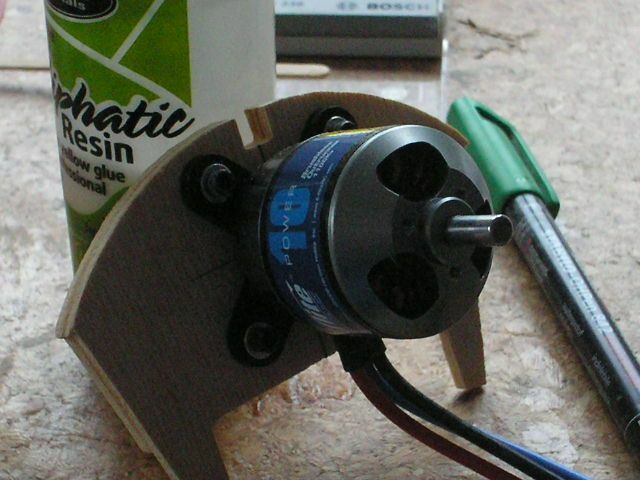 First I fitted the cowl (FC) and then tried trial fitting the motor - it interfered with FC. 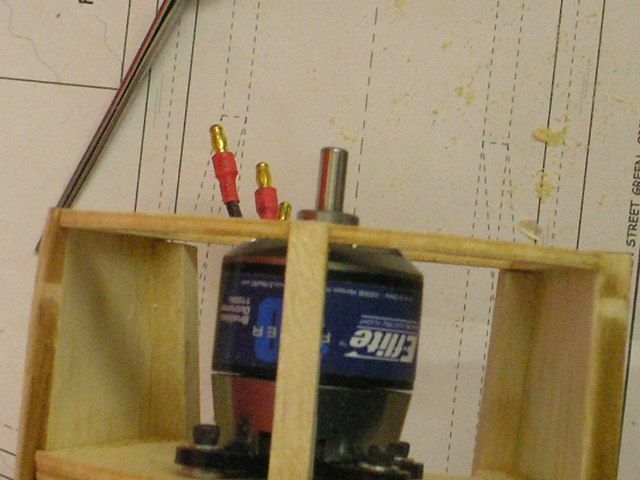 The only solution was to start sanding away at FC (the motor has to go where the motor has to go!). 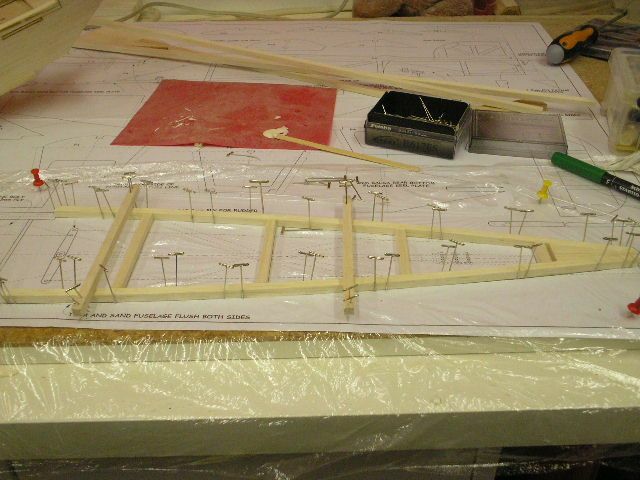 But there isn't a lot of "meat" on FC - so I decided to fit the top longeron to stiffen things up a bit,..
Now its time to apply the top sheeting. Its from 1.5mm sheet - which feels like tissue paper after sheeting the Tiffie! The trick here is to make a card pattern, you can cut that about and bend it until it fits perfectly, then cut out the wood. You should aim to reach halfway across the central longeron - leaving the other half for the second sheet on the other side. That's where we are up to - more tomorrow. Th trusty Swan-Morton. 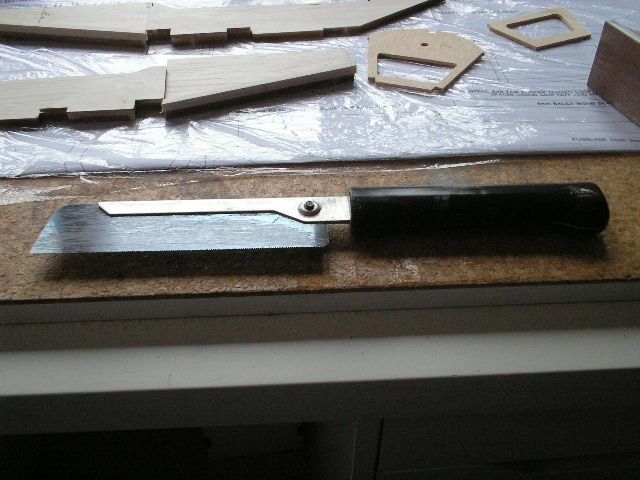 Get loads of blades you need to change them frequently as the only point of using it is how sharp it is! Blunt knives are one of the main causes for people cutting themselves. I like these engineers squares, nice and heavy so very stable in position. 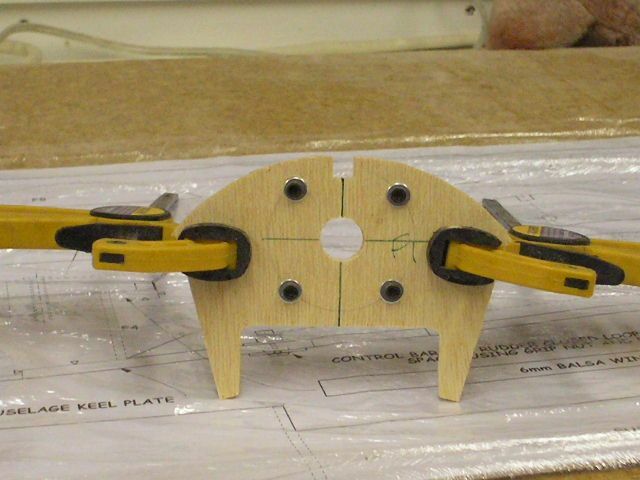 These mini sash clamps are great - B&Q and the like do them. 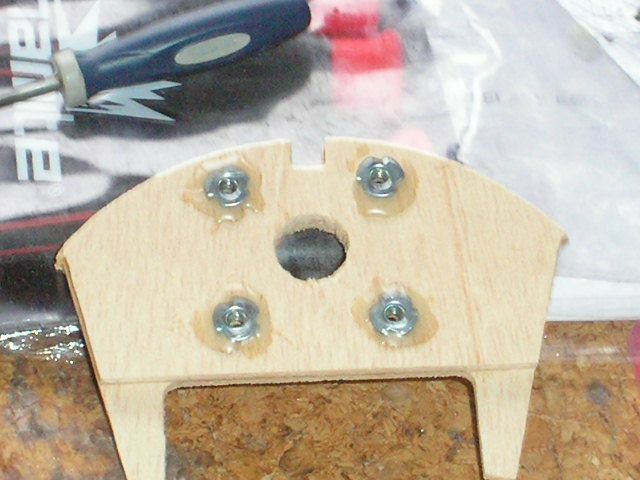 For adhesives I have used Aliphatic to join F1 and F1A and attach the doublers. PVA would have done just as well. 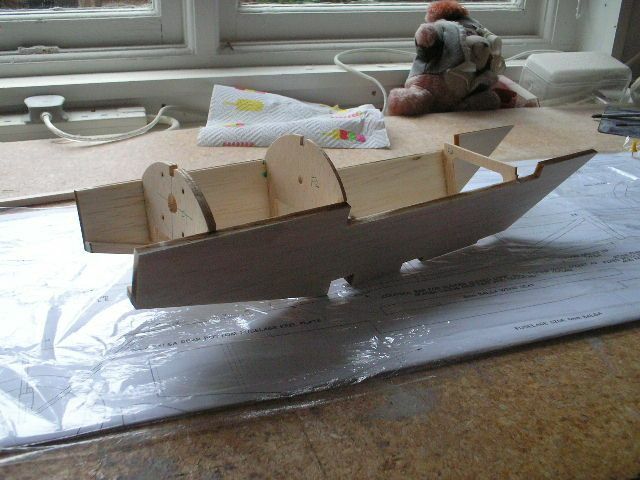 I also used Aliphatic to fasten down the sheeting. 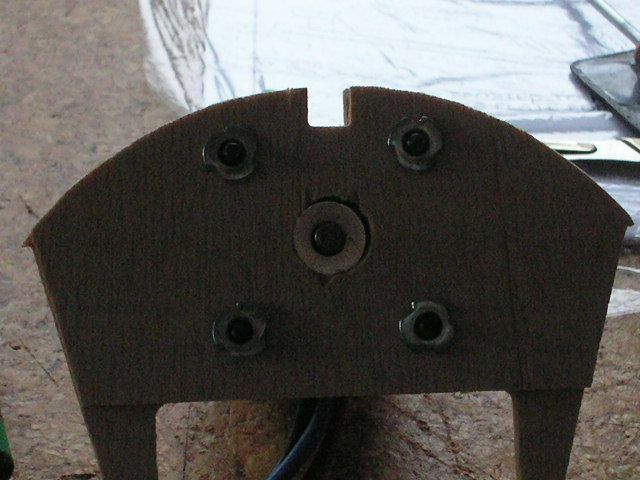 The U/C bearers were attached using epoxy (for strength). All other joints used CA. Personally would not make so much use of CA - though it does have its place - but I want to progress quickly! Just a small hint - probably not too late. I have finished my Dawn Flyer - and it suffers slightly from COG problems (tail heavy) . I have seen you packed a lot of power into the nose - so this will help for sure - but I have also the battery problem. I cannot move the battery as far forward as I want to as there is not enough room between the battery hatch and the battery holding plate. 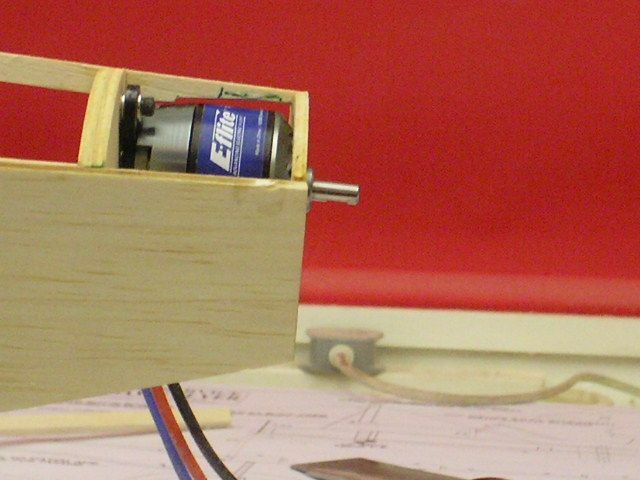 In the early stage you are now you could probably think about the final battery position. Nice work BEB glad I have not started yet (can't find plan). Must add note for new builders, do buy Swann Morton or X-Acto, and not the pound shop look alike X-Acto they are a hazard I know. My choice is the Swann Morton No2 with 10A blades. I will use Aliphatic through most of my build as CA is now affecting me. Very nice BEB, once I have managed to clear all my models out of the house and back into the shed (after losing the roof), I will be restarting mine. This is the inspiration I have been looking for! Thanks for the "heads up" on the tail weightiness VA - I shall certainly be keeping that in mind and seeing if I can the battery as far forward as possible. David - totally agree about cheap knives - the blades are made from some special material - cheese I think - which holds its edge for about 2 cuts and then will never take an edge again! 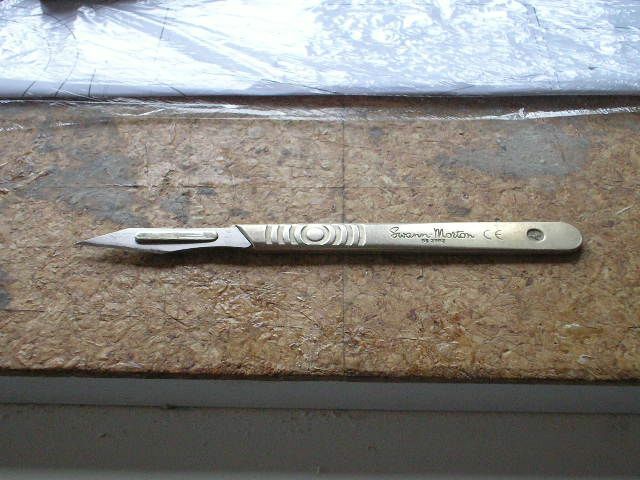 A pukha Swann Morton handle is not expensive - neither are the blades, especially if you buy them by the 50 as I do! Hi Dylan, good to hear from you again mate. Glad you are enjoying the blog - but I've still a way to go to catch up with you! OK, most of today I was on "family duties" so I didn't get in the workshop until about 5:00pm - but I did in the end get a decent session. 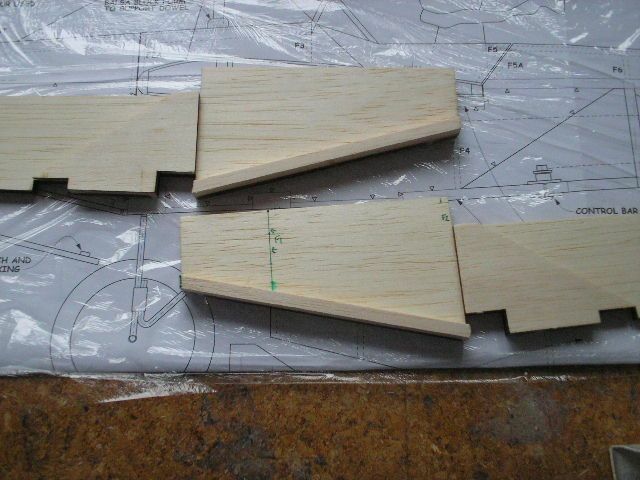 As you can see I have also sanded the hardwood U/C bearers flush with the fuselage sides. 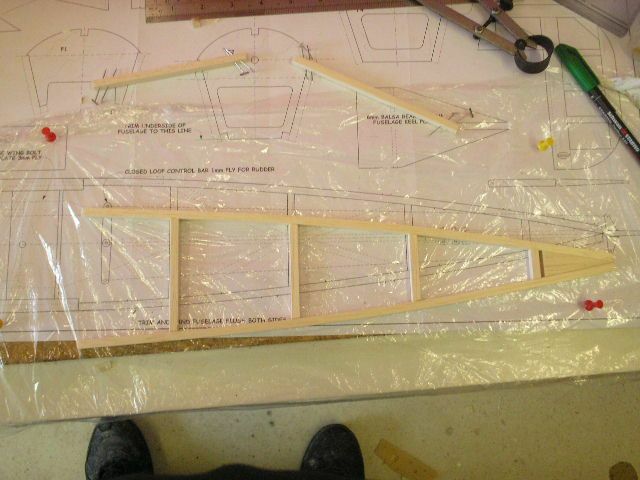 Here I am gluing the wing mounting plate in place having cut two 3mm rebates in the fuselage sides so it will sit flush with them. 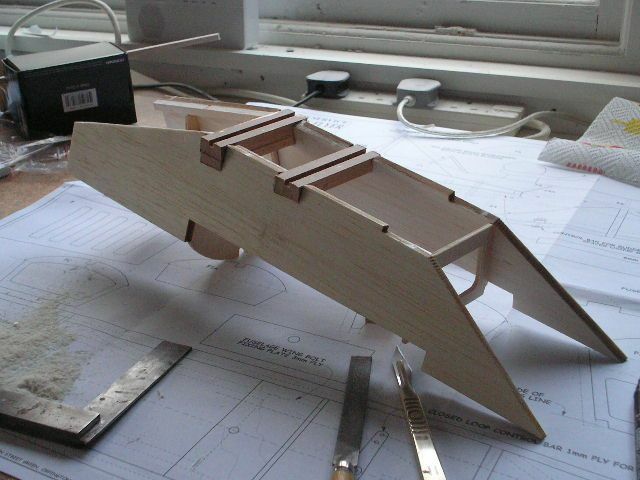 Am I the only person who thinks that it looks like I'm building a canoe? 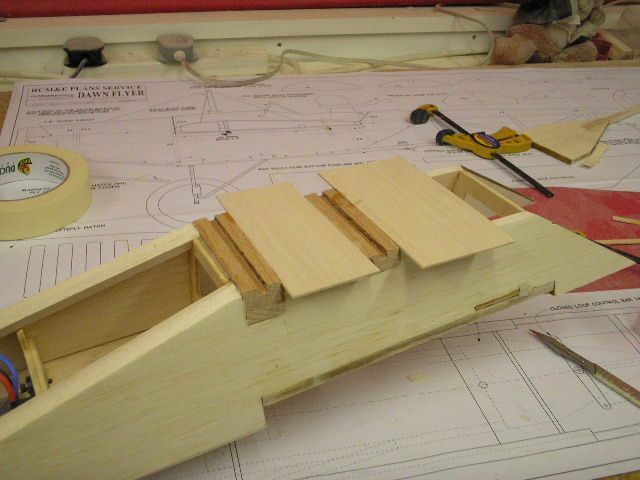 Now we can add the wing mounting supports to the top face of the sides - outside faces flush. 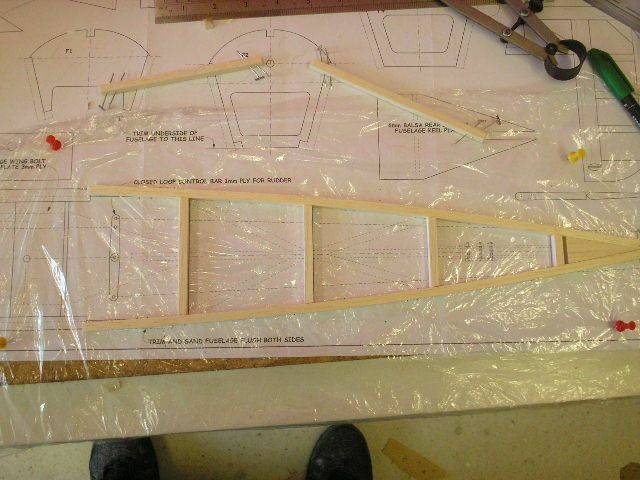 The plan refers to this part as a "keel plate" - there's no doubt about it,...its a canoe, Lynds is having us on! Seriously, this will form the bottom spine of the open rear end. A word here about wood choice. 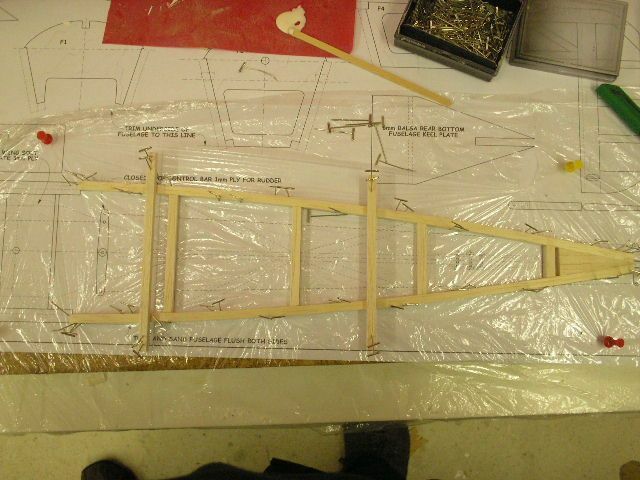 The plan says to use 6mm sq spruce or very hard balsa. 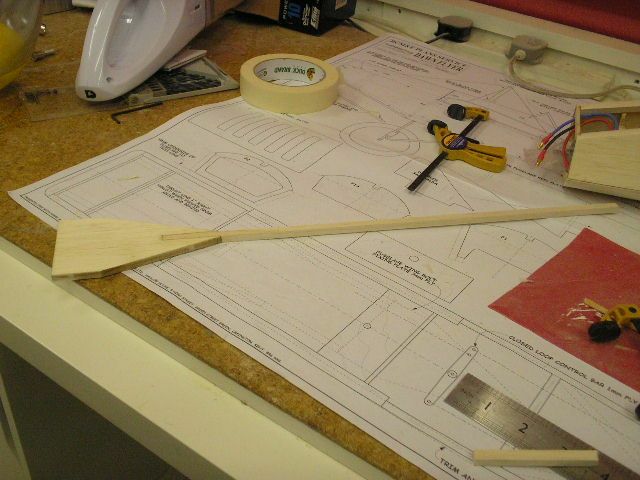 I don't have any spruce that size in stock, so its going to be balsa. 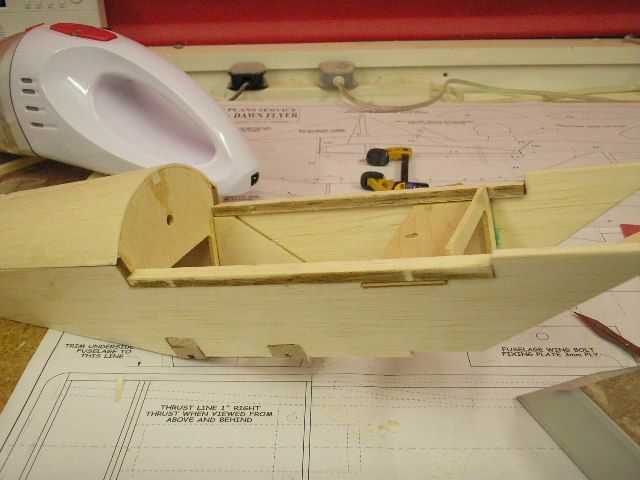 But what exactly is "hard balsa"? 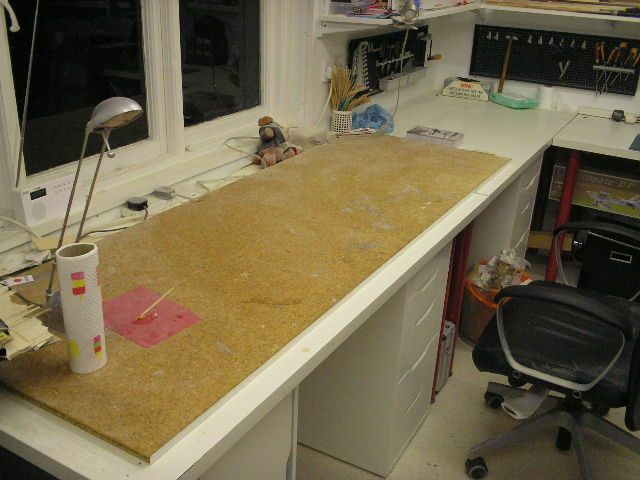 Well what I do is gather together all the 6mm sq balsa I have and start sorting it. Pick each piece up and flex it a bit in your hands - then put it into either the "wet spaghetti" pile or the "promising" pile. Then put all the "wet spaghetti" back in the store and start working through the "promising" candidates sorting them into two piles; the "Could be better" pile and the "oh that's got body" pile. Then work from the latter. 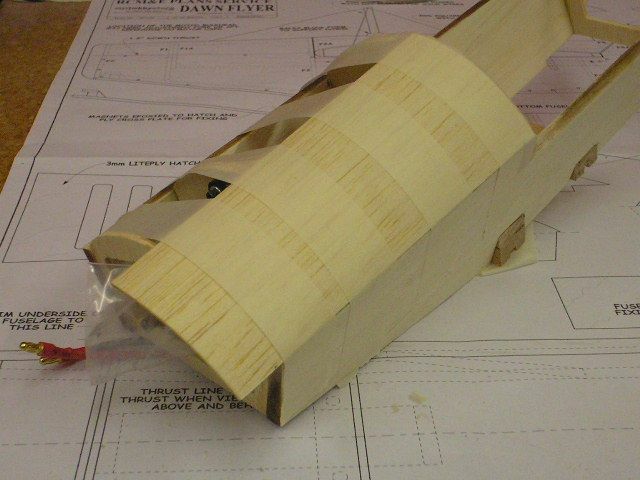 This is your "hard balsa"! This is built over the plan as can be seen. Lots of pins to hold it in place - it is pretty stiff, which is what we chose it to be! 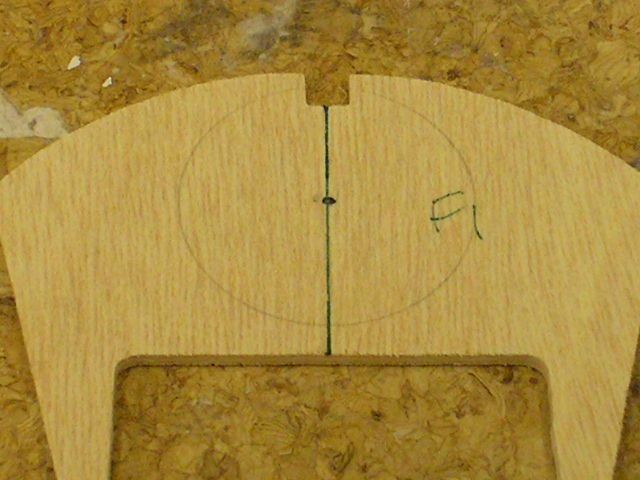 The piece over top, held in by being pieced through by two pins either end, is just there to hold the side pieces flat to the board. 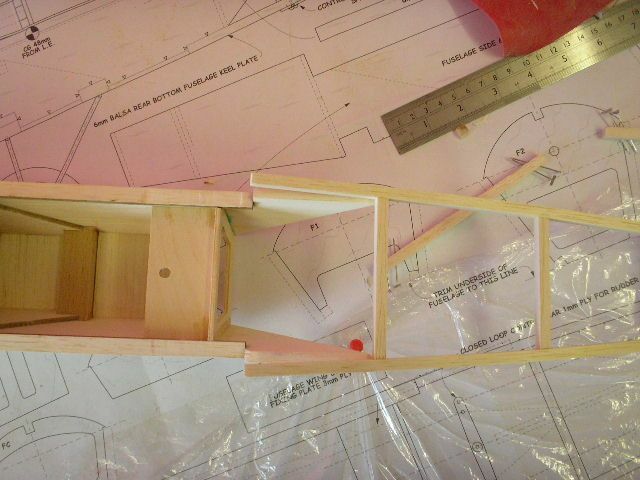 I've added a fillet at the end on my own initiative - otherwise I can't see whats holding the ends together! Don't be afraid to use your own initiative - even if its wrong we can always cut it out. Remember, "its only wood"! Onward and upward! Splice the mainbrace! More rear half tomorrow! 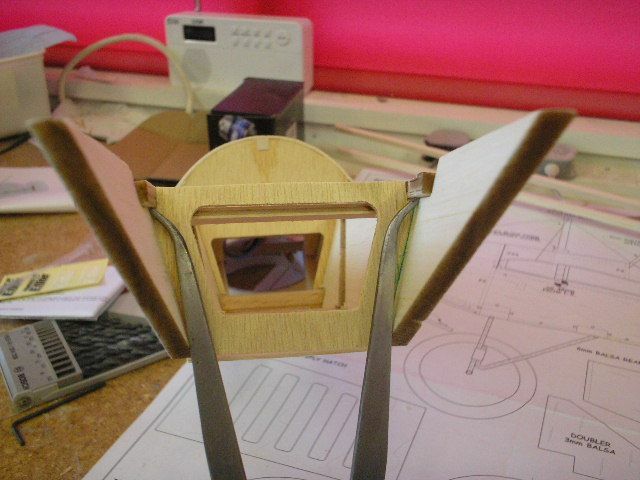 At this stage you might think about adding a pair of thin ply doublers to the rear end of the fus. 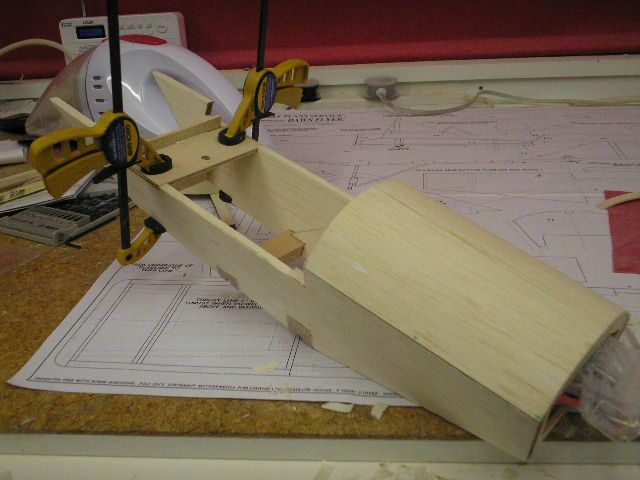 Where the sides rise behind the wing seat is a real weak spot as the two top rear longerons attach on top of these. The rear end relies on just these two and the lower hard longeron to remain attached. 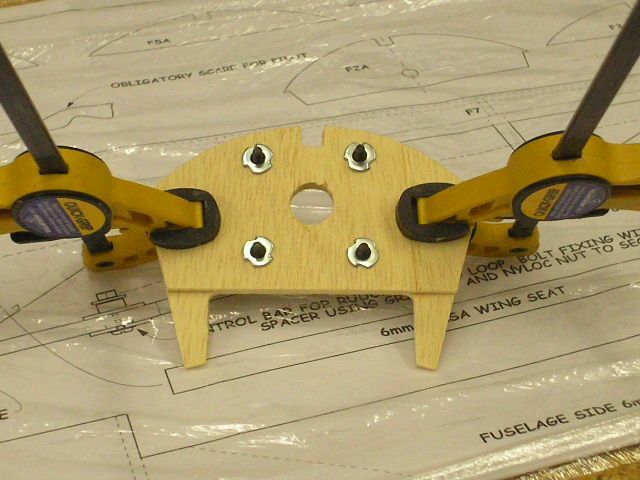 At the first hard landing the rear end will split these off and snap the lower longeron just where it attaches to the keel plate. Guess how I know . I added a pair of 1mm ply triangle doublers to match the fus sides on the inside behind the rear former and also doubled up the bottom longeron with about 4 inches of 6mm flat carbon. Negligable weight added but strong enougth now to use as a cricket bat. Nothing visible without very close inspection. I also found it very tail heavy, i have a 2200 3s upfront tight againt the back of f1 but still had to add a bit of extra in the nose. "Houston, we have a problem"! Ah, well it looks like we have the culprit - F4 is 3/16" narrower than it should be! At this point I would use a naughty word - I did in fact use several naughty words in the workshop, hence the blue tinge on the photos! - but here it would only upset my fellow mods! So this shows the problems you can encounter with a CNC pre-cut set of parts - they are only as good as people who cut them! Thinking back I had a similar problem with F1 on the Tucano last year. 1. 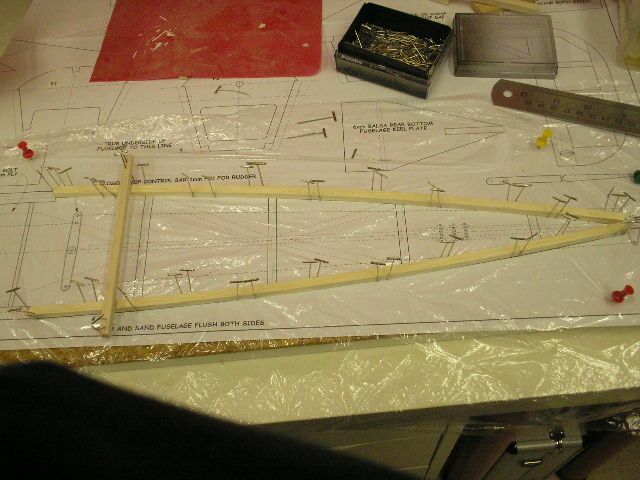 Remake the tail section, but alter the plan to make it 3/16" narrower. This is undoubtely the best solution - but it will take time. 2. 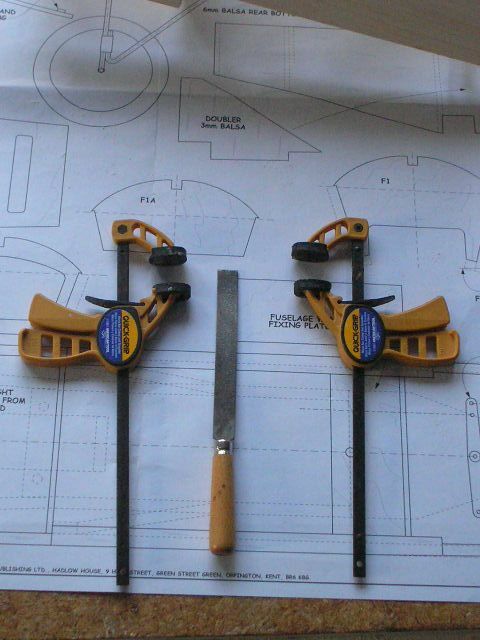 Cut the last two cross pieces out of existing tail section, trim them say 1/8" and 3/16" shorter respectively and reassemble. Messy and probably wouldn't end up being any faster than solution 1. 3. 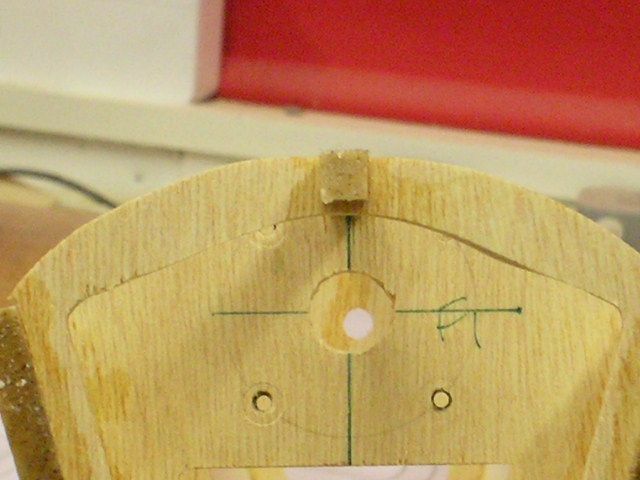 Glue on some 6mm sq "cheek pieces" to the sides of the body to effectively make it wider, mount to this and then try to "cover our sins" with a bit of shaping and sanding to blend everything in. 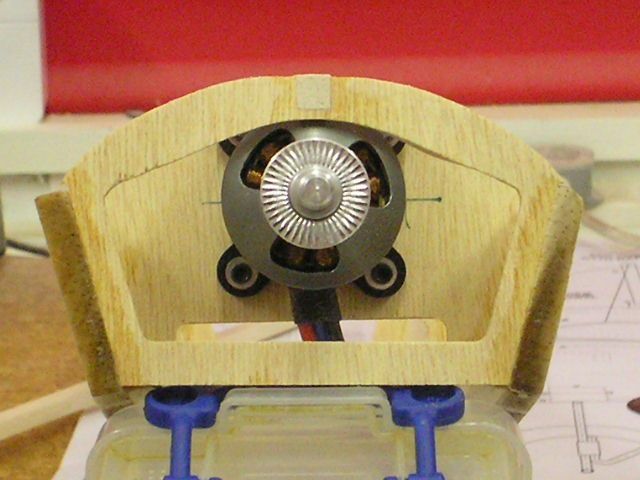 Fast solution but is a bit of a bodge. Well the term "bodge" is much misunderstood in my view! I believe the term originated among the bands of itinerant carpenters that roamed the medieval countryside. They would move from village to village making simple furniture. 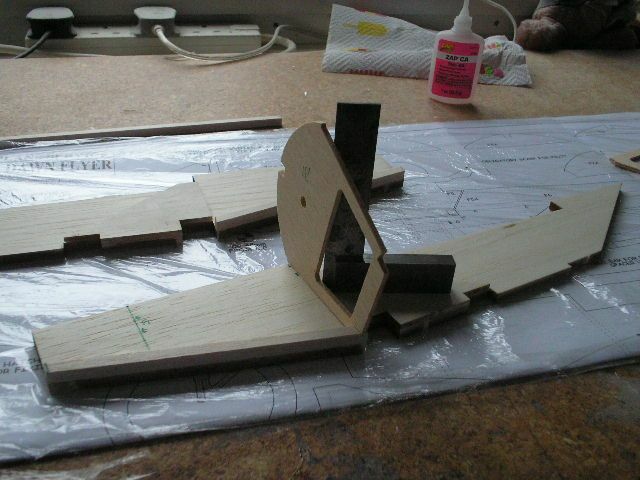 One would make legs, another seats, yet another spindles etc. Obviously there was considerable variation in these components. 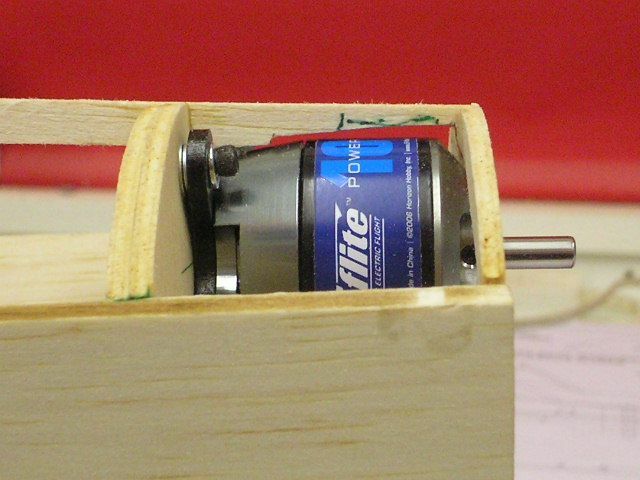 The "bodger" was the member of the team who selected a set of parts such that ithey would need minimum modification in order fit well together, he then performed the necessary "fitting". So in reality he was possibly the most skilled of the troupe in many ways. Right then, "bodging" it is! 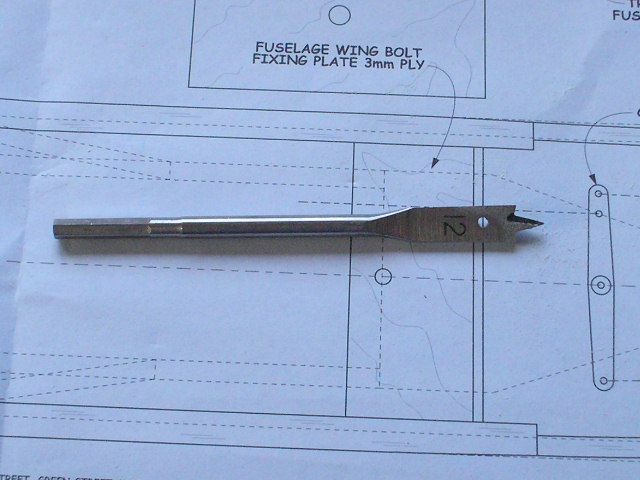 But - a note to those of you with the CNC pack - check that F4! You might want to consider re-cutting a new one based on the plan! There's a lot be said for "the Artful Bodger" BEB. I've always been heavily dependent on such techniques for getting the chestnuts out of the fire!